Electric guitars are fun, but if you want more versatility, check our guide and find the best travel guitar for you. Also, if you want to get an acoustic guitar too but don’t want to splash the cash on that, check out this post. 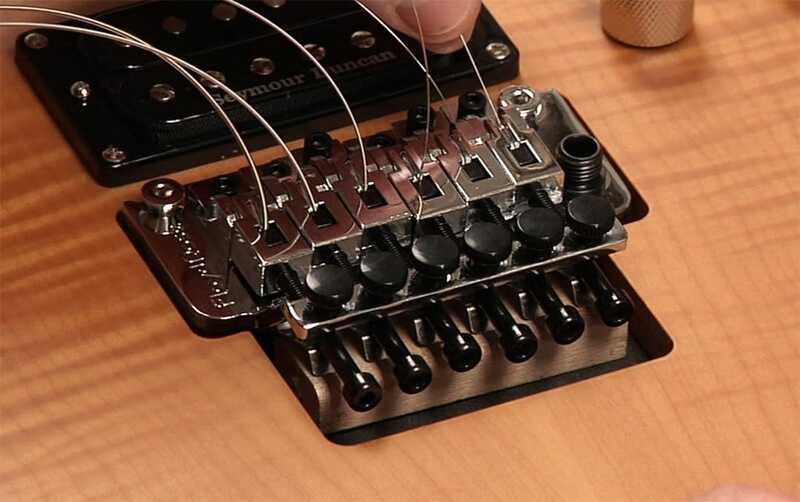 Here are some easy steps to follow when you change your electric guitar’s strings. You need to change your strings if they are rusty, falling out of tune quickly or gummy. 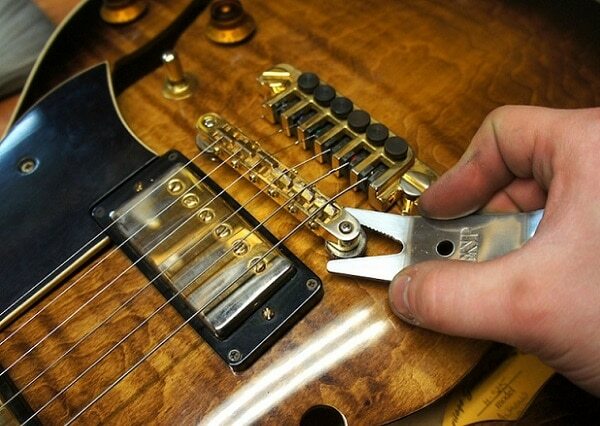 Professional guitar players change their strings frequently, some of them on a weekly basis. You will need some new strings if your current ones feel sticky or they’re slow to tune. Also, if you’re playing somewhere important, change the strings the morning before you actually play. Before removing the strings, note the path that they have. If this is the first time you change the strings, take a picture so you know how everything should look. Some guitars have special winding patterns or holes through which the strings have to go through, so it’s important to pay attention to those details. Don’t just cut the strings off unless you have no other alternative. Instead, turn the tuning machine so that the string gets loosened and do that until you can pull the string out by hand. If the string sounds lower, it means you’re doing a good job and you’re loosening it. This is a good method to ease tension gradually. 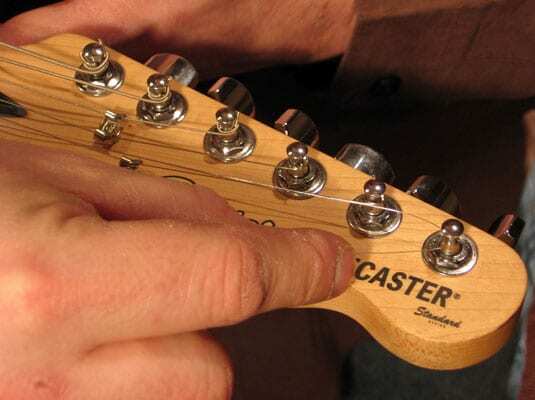 If your guitar has a usual bridge, like a Stratocaster, after you unwind the strings you can remove them by pulling them out of the back of the guitar. But don’t pull with force and to make the situation easier push them through, from the other side and grab the small donut-shaped end. Be patient and don’t yank the string out, take your time. It’s important to clean the guitar whenever you change the strings. You should pay more attention to the fretboard. You don’t usually have access to that part of the guitar because it’s covered by the strings, so when you get them off make sure to clean it. You should know that most electric guitar fretboards aren’t finished and they need lacquer sprayed on them. If your guitar’s fretboard is made of rosewood or ebony, chances are it isn’t finished and you will have to do that yourself. There are many products that you can use to clean the guitar and most people prefer oil soap. That is because it helps clean the wood and also conditions it. That is particularly important for the fretboard because due to the stress of you playing on it, it can dry out and crack. When cleaning your fretboard put just a bit of oil soap on it, you don’t need much. Then take very fine steel wool and rub the fretboard well to eliminate any dirt buildup. Don’t go too close to the pickups, or cover them with something, because the magnet in them will draw the steel wool. You can also polish the frets with the steel wool until they are clean. By keeping your guitar clean you ensure that the new strings are protected, everything looks good and it will also feel better. Make sure to have the correct strings and note that most of the times you will need regular weight or lite strings, nothing else. Some experienced guitarists like to use heavier gauges, but you can’t simply choose a heavy gauge if you don’t know whether your guitar is made for it or not. Strings that pull too hard can bend your guitar’s neck. Take the guitar and lay it flat on a soft surface and in a position that lets you handle it with ease. Make sure you have enough room to move around it and place a towel or blanket under it to avoid scratching. You can rest the head on the edge of the surface to make the process easier. Take each tuning post and turn their hole so that they face you, pointing away from the string. Then take the first string and pass it through the bridge and into the tuning peg. You have to thread it from the inside of the guitar outwards. Most people like to start with the thickest string, the E. After threading it through the bridge and the tuning peg pull it away from your guitar so you have about 3 inches of slack, as you want to have enough string to tighten around the tuning peg. After that bend the string in an S shape, with your right hand coming towards you away from the guitar and the left hand pushing towards the other tuning pegs. Take the end that comes out of the peg and pull it under the part of the string that is fed into the tuning peg. Then bring it back up and you essentially tie a little loose knot. After you fed the string through the hole of the tuning post and you created a small loop, it’s time to tighten it. To do that place your finger on the string approximately 2 inches before it meets the tuning peg. You will need to press it against the fretboard, but gently, as you only need to hold it in place. Start to turn the tuner in a counter-clockwise motion and when doing that be sure that the string is winding well, uniformly around the tuner. Don’t tighten it too much, you don’t want to break it. Fine tuning comes later. Do the same with all the other strings and remember to leave some slack and not tune them to perfection right from the start. Instead, use a tuner to help you see how off-tune the strings are and slowly work towards tuning them perfectly. Take your time with this, you don’t want to break the strings. After that, the only thing left to do is cut off the ends that stick out of the tuning poles. Use wire cutters for that and leave just a bit of string out.